Oilfield Hose Products - JGB Featured Markets - JGB Enterprises, Inc.
JGB Enterprises has been a leading supplier of hose, fittings, and hose assemblies to the Oilfield Market since 1977. Our assemblies service pressure hydro-fracking, flow back, tank truck, pumping services, high volume water transfer, cementing, and acidizing. Our exceptional customer service will keep you drilling twenty four hours a day, seven days a week. We have the largest oilfield hose inventory, so we can provide just in time solutions in an effort to reduce unnecessary down time. Our multiple locations can provide in field technical support, and assure timely delivery of your assemblies. JGB Enterprises specializes in the supply of premium quality Hose Assemblies for Oilfield Drilling. We supply advanced assemblies in a full range of sizes and types for overall drilling efficiency in demanding oil and gas applications. Our supply of expert assemblies will provide excellent drilling, long run life, and an excellent combination of drilling efficiency and durability. Successful cementing operations result in a cement sheath to bond and support casing and provide zonal isolation. Good zonal isolation helps prevent the loss of production, control inter-zonal flow and/or flow to the surface, reduce water production and improves confinement of stimulation treatments. JGB Enterprises supplies a full line of the toughest, most versatile, expert Cementing Hose Assemblies. We provide a wide range of sizes that can handle up to 5000 psi. Our assemblies will handle the tens of thousands of gallons of cement necessary for expert casings. Opening rock formations to release natural gases via Hydraulic Fracturing requires expert hose assemblies. JGB Enterprises is a leader in the manufacturing of custom Frac Hose Assemblies to transfer necessary fracturing fluids such as water, oil, and hydrochloric acid. Our Frac Hose Assemblies are rugged and flexible enough to handle the coarsest fluids, and highest pressures associated with hydraulic fracturing. Transferring millions of gallons of water from ponds, tanks, and lakes is crucial to keep your drilling site productive. Whether your application involves discharge, suction, or both, there’s a high quality JGB Enterprises Water Transfer Hose to fill your need. When it comes to drillsite support, JGB Enterprises manufactures and distributes the assemblies you need to keep your rigs running smooth. From expert hydraulic assemblies to camlocks, we offer support products that maximize productivity for every application. JGB Enterprises stocks Oilfield Drillsite Support Fittings from many manufacturers. Only a fraction of our fittings inventory is represented online. If you don't find the type you are looking for, please let us know. Our extensive range of drillsite support fittings and oilfield hoses allows JGB to assemble and test any hose needed for oilfield drillsite support. 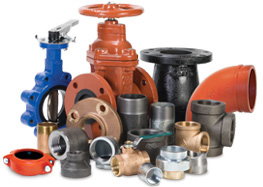 Smith-Cooper International Valves, Fittings, Couplings. Couplings, Fittings and Valves are UL Listed & FM Approved. Sizes are from 1" through 24".